We have built a solid business based on establishing a good working relationship with our clients offering a reliable service with a fast turnaround, usually sharpened and returned within 2-3 days. Our clients even enjoy a same day or overnight sharpening service for special tooling, thus avoiding the need for duplicate expensive cutter blocks. Our engineer is a time served toolmaker which allows us to sharpen a very comprehensive range of tooling; we have a wide range of machinery and equipment to enable our comprehensive sharpening service. 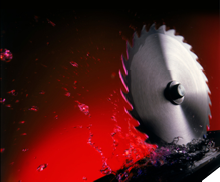 As well as sharpening, we supply a complete range of high quality saw blades and cutters for all manufacturing industries. We only sell quality products and do not stock the cheaper versions, as through experience, cheaper blades and cutters are not value for money due to their failure in operation. Due to our engineering background we also offer engineering services, milling, turning, surface and cylindrical grinding and fabrication. We are pleased to offer a friendly and personal service to assist you with your business, if you need help or assistance call or e-mail and we will be only too happy to help.